Looking for prices on our San Diego private sport fishing Charters? Interested in Oceanside private sport fishing charter prices or want a charter price for private sport fishing in Southern California? You came to the right spot, see our current Charter Prices listed below! Sea Star Sport Fishing Charters has been operating since 1982 offering the best private sport fishing charters in Southern California. Experience the best in San Diego private sport fishing charters with Captain Joe and the crew of the Sea Star out of Oceanside Harbor in Calif. Hook up with Captain Joe Cacciola and the Sea Star, a 60-foot by 20-foot fishing machine with twin 350 horsepower, Cummins diesel engines! The Sea Star can accommodate groups of 2 to 40 people and all are welcome – experienced and novice alike. At this time, Sea Star Charters only accepts private group charter reservations. We do not sell any single or individual open party tickets. If you are interested in chartering the Sea Star, please call our reservation office directly at (760) 966-0111 for more information and availability. * All credit card transactions will incur an additional 3.5% processing fee. Groups of twenty, up to a maximum of thirty, can enjoy a day of sportfishing on the Sea Star like many have done for the past thirty years. Corporate groups, church congregations, and large families have access to and enjoy hot food, hot and cold beverages, and snacks directly from the galley. Our beer and wine license allows us to offer alcoholic beverages while you fish! Additional passengers can be accommodated at an increased cost. Our most popular trip is the Small Group Weekday Special because anglers enjoy the spacious deck, friendly crew, and fantastic galley food. These discounted weekday trips offer an incomparable private charter experience for a comparable open party cost. This trip is great for small groups who want an affordable and quality fishing experience from Oceanside Harbor. Small groups up to six can take advantage of our value plus trips at a significantly reduced charter price. We include rental equipment for everyone at no additional charge. This trip is ideal for vacationing families who would like to enjoy a day out on the Pacific Ocean. The galley will be closed for this trip, therefore, groups can bring their own food and beverage onboard. $400 per Hour, $800 Minimum, 45 Passengers Maximum. * All credit card transactions will incur an additional 3.0% processing fee. We offer private group charters for sport fishing, whale watching and floating marine science labs. We also offer burials at sea. For more information on Sea Star Charters, please give us a call on our reservation line at (760) 966-0111! Shakespeare Fishing Tackle, makers of fine fishing tackle. We now use and rent exclusively Shakespeare rods and reels aboard Sea Star Charters. Penn Reel Co. makers of quality saltwater fishing reels since 1932. 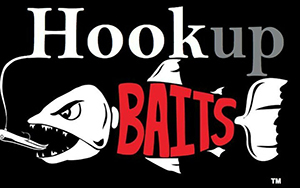 Hookup Baits Designers and manufacturers of specialty fishing lures and jigs.